Powers/Abilities: Lewis can reform his body into any conceivable shape he can think of. He does not possess the ability to alter his color, nor can he replicate the forms of others, at least not at his last known skill level (at the age of 16). He can adopt a variety of monstrous forms, extend tentacles, and alter his consistency to a virtually liquid form. It is unclear whether he gain mass while shape-shifting, he may be adjusting his volume only. Lewis is a very likeable guy, but he tends to avoid forming lasting relationships with girls. He acts as the emotional center of the Freex, demonstrating the greatest loyalty to the others and inspiring loyalty from them. (Freex#5 (fb) - BTS) - Lewis was one of a number of infants in a hospital injected by the woman known as Wetware Mary with nanotechnology derived from the Fire People, intended to create a race of super warriors. (Freex#8 (fb)) - As a child, Lewis saw his parents constantly fighting. Being of mixed heritage (white mom, black dad), his parents received a lot of pressure from their parents who did not want them together, and unfortunately took it out on each other. Little Lewis thought that he could make his parents get along if he could just be good enough. (Freex#8 (fb)/ 1(fb)) - Feeling connections to both of his parents' races, Lewis always strived to bring together people of different cultures. He eventually achieved great popularity as a star football player in high school, becoming a great friend to the guys, and a charmer to the girls. However, during one game, he took a hit that he wasn't prepared for, and his body exploded into a liquid mess. He quickly recovered and began to pull himself together, but his transformation was seen by everyone. Hurt by the screams and exclamations, Lewis ran home. The news proved to be the final straw to his parents, and his mother, under pressure from her family over the "monster" she had given birth to, left him. Unable to take the fact that everyone knew his secret, Lewis ran away from home. He lived in the streets, bouncing between youth shelters. Eventually he received a call from Michael (Plug), telling him there were others like him. Lewis imagined that he could form a new family. (Freex#1 (fb)) - Lewis found Ray (Boom Boy) wandering aimlessly in the streets, terrifying all around him. Lewis convinced Ray to join with him and he looked out for Ray, who was unused to interacting with anyone. Ray saw Lewis as the hero from his favorite book, and called him Huck. (Ultraverse Presents#0/6) - Lewis and Ray received a message which they followed to locate and recruit Valerie (Pressure), pulling her away from a confrontation in a Laundromat. (Freex#1) - Lewis, Ray, and Valerie fought off some cops while stealing some supplies. They found Angela (Sweetface) outside of their room, and then Ray gave Lewis his code name: Lewis. They were then confronted by Michael, who had been the one to summon them all together. (Freex#2) - Valerie blew the computerized form of Michael to pieces. When Lewis tried to convince her that Michael could be someone just like them, Valerie blasted him, too, and then fled. Lewis comforted Angela, who was distraught over her freakish tentacles, calling her "Sweetface." After calming her, they returned to Ray and Michael (Val had fled), and Lewis led the Freex to escape the police when they arrived. (Freex#3) - When Michael was shot by the police, Lewis figured that he could be saved by connecting him to an electrical system, which they did. Lewis then led them to follow Michael's signals to relocate him, and they met met up with Val (and her ally Rush) as they were being attacked by the Master of the Hunt and the Bloodhounds. After helping them escape, Lewis tried to convince Val to come back to the group, but the jealous Rush punched him. Lewis tried to explain how they were different than Rush, and Rush expressed his disgust at this, causing Val to tell him to hit the highway. (Prime I#8/2) - Unable to sleep, the Freex discussed what they saw when they closed their eyes. For Angela, Lewis, Michael, and Val, it was how when they're powers surfaced their lives were changed; for Ray, when he closed his eyes, he saw little colored dots. (Freex#4) - The Master of the Hunt and his Bloodhounds found and attacked the Freex again. They escaped (though Michael was taken prisoner), and Lewis helped support Ray after he was wounded by one of the Hound's bite. He discussed the surfacing of his powers with Angela, and the Freex were taken in by the modern day hippie Ruby. The Master tracked down the Freex and shot Ruby. (Freex#5) - Lewis and the Freex managed to fight off the Master, freeing Michael in the process, and they fled into the night. (Break-Thru#1) - Lewis and the Freex observed the energies being released by the Entity from the Moon, and their effects on Val. (Freex#6) - The Freex were duped into an alliance with Mangle, having no idea about his true nature. Michael and Angela were suspicious of Mangle, but Lewis trusted him and convinced the others to agree to join with him. Mangle led them on an assault on J. D. Hunt's estate. While the Freex took down Hunt's robot guards, Mangle attempted to assault Hunt's son, Guy, until he was stopped by the Night Man. The Freex mistakenly fought the Night Man, and then fled again with Mangle, continuing the pursuit of Guy. 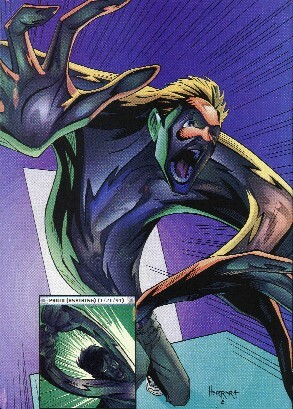 (Night Man#3) - The Freex followed Mangle's lead in pursuit of JD Hunt. Upon finding Hunt, they were attacked by his NuWare Wolves. Night Man arrived and fought Lewis and the other Freex loyal to Mangle and stopped the villain from assaulting Guy Hunt. The Freex fled during the final confrontation. (Break-Thru#2) - As the ultras on the Moon joined their minds and energies against the Entity, the minds of all ultras, including the Freex were joined with the group effort. Afterwards, the energies ceased, and the Freex regained their senses, though they refused an offer for further aid from the Night Man. (Wrath#4) - Aladdin told Wrath that the Freex were a danger to society and sent him to bring them in. Wrath ambushed and defeated Ray and Angela, but was then confronted by Lewis and Val. (Wrath#5) - The combined power of the Freex defeated Wrath, and they then left him bound in his own manacles to prevent him from coming after them again. (Freex#7) - Lewis led the Freex to steal some clothes, which led to more in-fighting, which Lewis tried his best to defuse. Lewis tried to get the group to head back to reunite with Ruby, but was hurt when both Angela and Michael disagreed with him. Angered, he ran off by himself and Angela followed him. They tried to visit Ruby in the hospital, but were forced to flee from police. They returned to the others just after they had fought off an attack from the Night Patrol. The rest of the group then sided with Michael in his plan to try to learn their origins. The despondent Michael was drawn into the realm of the Lost Angel. (Freex#8) - The rest of the Freex managed to follow Lewis and save him from the Lost Angel, after which they were confronted by the Old Man. (Freex#9) - The Old Man easily defeated the Freex, tricking Val into blasting Lewis, and told them that they needed a leader to train them. He then led them to escape another attack by the Night Patrol. Lewis stepped back and let Michael decide that they would refuse the Old Man and keep searching for their origins on their own. After he was gone, they realized that Ray was missing (abducted by Contrary and taken aboard her ship). (Freex#10, 11) - Lewis came up with the idea that the flying object that took Ray might have come from Mt. Shasta, and he led the group to find him. The whole group was captured by Contrary (Lewis was blasted into unconsciousness by Waver) who sought to force them all to join her. The Freex broke free, but as they battled Contary's young wards in the Academy, Ray announced that he had decided to stay with Contrary to gain an education. Cayman, one of the Academy, decided to join the Freex. BTS - The Freex were again joined by the Old Man. (Prime I#13/2) - Prime traveled to the Midwest in an effort to confront the monsters of the Fire People that had crawled up from their underground city. The Freex were also investigating this--under the direction of the Old Man--and they ran into Prime while searching the China Lake Naval base. (GS Freex#1) - After the standard fight of mistaken identities/motives, Prime joined the Freex and the Old Man in an investigation of the tunnels of the Fire People. In the depths of the realm of the Fire People, they found a number of statues with the appearance of the a number of unidentified superhumans, but also of what appeared to be the Freex themselves. (Freex#12//Ultraforce I#1/2) - The Freex, Old Man, and Prime were attacked by several of the Monsters of the Fire People, but Michael located a group of headpieces that the Freex put on, allowing them to control the Monsters. Prime returned to the surface as the rest of the Freex continued their journey, encountering the Guardian of the Cave. (Freex#14) - Contrary helped the Freex defeat the Night Patrol, but Ray, who had come along with the rest of the Academy, recognized that Contrary had been the one to give the Night Patrol the enhanced weaponry in the first place. Lewis was very happy when Ray rejoined the Freex, and he chided Cayman when he made fun of the code names Ray had given them. They went back down to the realm of the Fire People, where they found the Savior breaking out of his containment. Ray forced the door to the Savior shut again, and he then elected to stay behind to hold the door in case the Savior threatened to break out again. Lewis tried to convince him otherwise, but to no avail. (Firearm I#15) - Rafferty told Firearm that he was going to kill one of the Freex, then beat him senseless and sabotaged his gun. The dazed Firearm stumbled after him and instead collapsed amidst the Freex. (Freex#15) - Arriving in San Francisco back on the surface, the Freex and the Old Man joined forces with Firearm in an effort to stop Rafferty, the killer of Ultras. The Freex fought the Night Patrol again, but Michael saw Rafferty aiming at Cayman and leapt in his arrow's path, taking the arrow in his own chest, and dying. (Firearm#15/2) - Firearm refused to allow the Freex to join him in going after Rafferty. (Freex#16) - The Freex attended the funeral for Michael, along with the Academy members, Contrary, the Night Man, and Ruby. After fending off another assault by the Lost Angel, the Old Man goaded the Freex into a fight. They defeated him, proving that they were now ready to stand on their own. They decided to head back down the tunnels and visit Ray, and when they paused to rest, Lewis consoled Angela, which led to a sexual encounter between the two. On the second half of the trip, they were pulled through a time warp. (Freex#17) - The Freex arrived in ancient Egypt, where they encountered an early group of Someday Champions (recipients of the nanotech/wetware power created by Prometheus) as well as Rune (in the guise of the Priest of Amon-Ra). Lewis enjoyed the view of Tetramam to help him pass the time spent. Angela was jealous, and when she mentioned that she thought Michael might still be alive, he told her that they should forget their little rendezvous. Angela slapped him, and then Val explained that Angela might be pregnant. After staying for over a month, the Freex helped drive off Rune when he attacked Analla (one of the Someday Champions). The Freex then returned through the time portal back towards Los Angeles. However, upon returning they had gained a new member, AJ, whom they all remembered as if he'd been with them all along (in place of Michael). (Freex#18) - Contrary convinced AJ, Angela, and Lewis to lead her into the realm of the Fire People, with the agenda of usurping more of the advanced technology she would find there. They rejoined Ray, who explained what he had learned about their origins from books he had found, including hints that Contrary was Wetware Mary. The Freex saved Contrary from the Monsters of the Fire People that had found her. As Val and Cayman returned to Earth, Contrary tried to forge an alliance with the Freex, but AJ recognized that she had ulterior motives and resisted her. Contrary incapacitated the Freex with a disruptor weapon that affected their helmet, and she then took AJ away to her citadel for further care. Lewis and the rest of the Freex (including Val and Cayman) found themselves trapped in the realm of the Fire People, and they heard the Savior stirring in his containment chamber. Comments: Created by Gerard Jones and Ben Herrera. And so, if we ever make it back to the Ultraverse (not likely), assuming the Ultraverse to not have the sliding timescale, there should be a son of Lewis and Angela, over ten years old. Maybe it would have some combination of their powers (though, with training, Lewis should be able to form tentacles just like Angela's).